Protein Packed Overnight Oats are a quick and delicious breakfast option for days when you need a boost for working out or playing hard. This chocolate Oats recipe is delicious, but you can make all kinds of flavors too! Have you been enjoying any adventurous winter activities this year? 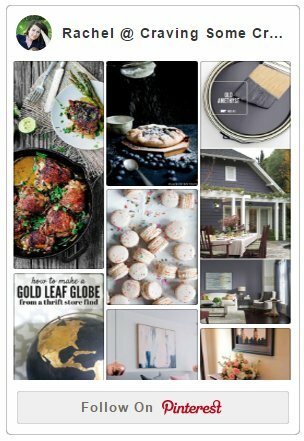 I have officially become obsessed with all things winter! If you follow along on Instagram, you may have seen highlights from our recent adventure skiing at Snowshoe Mountain Resort. It was a much needed weekend getaway after the holidays. Not wanting to miss out on any of the fun, I wanted to keep up with my energetic son and hubby, who is an experienced skier. We needed a filling breakfast that would pack an energy punch and be great to grab and get on the slopes early. 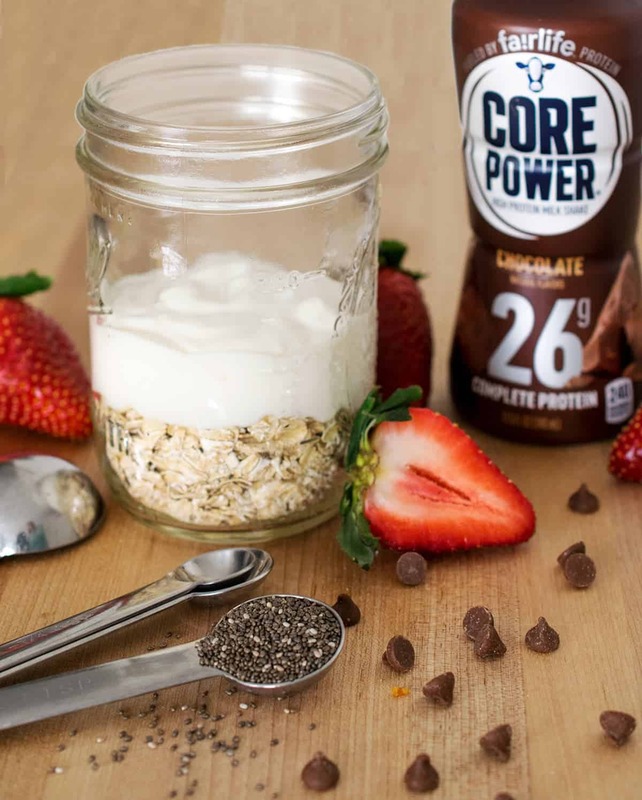 Overnight Oats is the perfect breakfast to prep for busy mornings, and I made sure to add Core Power® for that extra boost of protein to satisfy and recover from our adventures. So today I thought I would share with you all of the highlights of our trip and a high protein overnight oats recipe that you can use to get your morning started right for those days that require a little boost or recovery from a good workout. Overnight Oats are super simple to put together and then top with your favorite fruit, nuts, and spices. 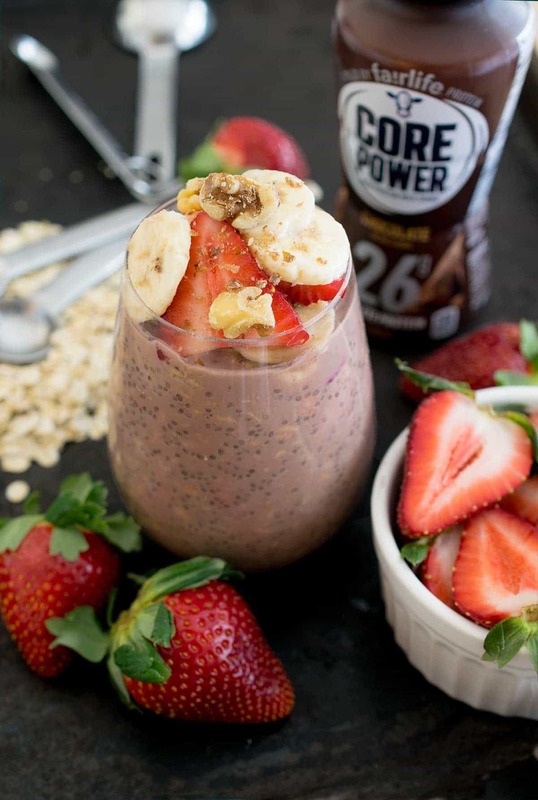 Plus this recipe includes Core Power® which utilizes a one of a kind protein that is fueled by fairlife® milk. Just last week, I picked up a large array of fruit and ingredients from Kroger to make other flavor combinations to enjoy. I don’t often get to show off my region- I am a Virginia transplant- but it is beautifully picturesque here. West Virginia is wild and wonderful – that’s what they say! It’s also home to some of most beautiful mountain ridges and cozy hospitality of the Shenandoah’s. Snowshoe Mountain Resort is the #1 destination for skiing and snowboarding in the Mid-Atlantic and Southeast regions and a perfect year-round destination for adventure filled vacations or weekend getaways. Isn’t this view from the slopes a perfect winter wonderland? Our stay was incredibly well-timed with the first big snow storm which brought fresh, powdery snow to the area. You could feel the excitement in the air as the staff and snowboarders knew this was the best time to ski (or so I am told). Oh, and did I mention I am a total beginner when it comes to skiing? I’m that person that people refer to when they say, ‘If she can do it, anyone can!‘ in regards to anything adventurous, so if I survived my first ski holiday and loved it, I’m positive you can, too. If you are a beginner like me, I highly recommend the top-notch instructors and terrain based learning system at Snowshoe Mountain Resort. They will have you riding with confidence in no time! But it isn’t all skiing! I loved that there were activities for the whole family including a massive indoor kid’s area. And one of our favorite activities was tubing down the speedy snow hills at the Coca-Cola tubing park. Plus there’s snowmobile tours, an escape room, horseback riding and sleigh rides, and a full service spa for the ultimate in relaxation. After a long day enjoying all the activities, it was pretty much a guarantee you could find me in our resort room getting cozy by the fire with a hot cup of Core Power®. Best way to recharge! Are you ready to take a trip yet? I’ve got a deal for you at the bottom of this post! But first, let’s get to the overnight oats recipe. Before our trip to Snowshoe Resort, we stopped by Kroger to stock up on snacks and ingredients for the overnight oats. 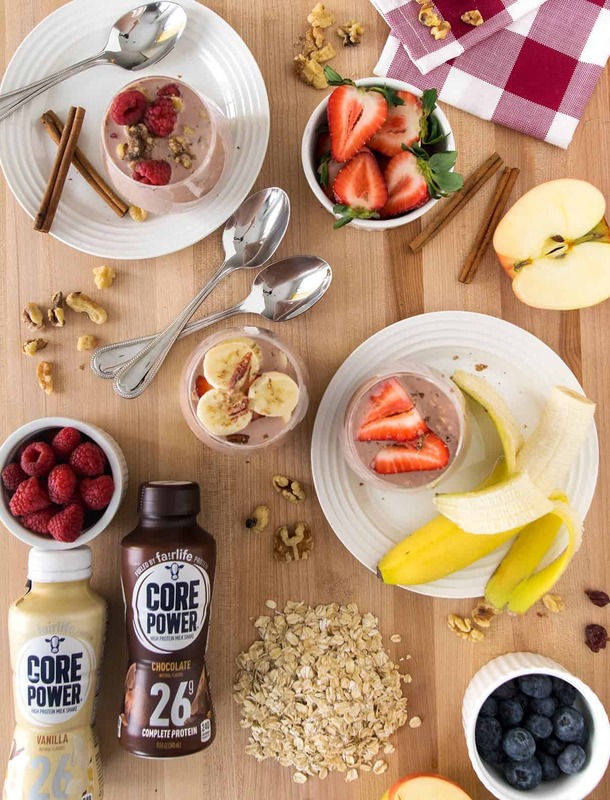 Since we are limiting sugar in our diet, like 84% of consumers, I think that it is great that Core Power® will be introducing an updated 14oz formulation with 80% reduced sugar (vs previous formulation) and still has 26g of protein per bottle. It’s extremely simple! I have made this recipe hundreds of times at home for busy school mornings, and it is always delicious. In a jar or bowl, mix together 1/4 cup of old-fashioned oats, 1/4 cup plain or vanilla Greek yogurt (I use vanilla), 1 1/2 tsp of chia seeds, and 1/3 cup of Core Power®. I love my overnight oats with Chocolate Core Power® and then topped with fresh bananas, strawberries, and a few nuts. Feel free to experiment with all sorts of combinations like Banana Core Power® with Strawberries or vanilla with Blueberries and a touch of maple syrup. This recipe makes about 1 cup of oats. I like more fruit in mine, but you could also serve a double helping like in the photos if you don’t want as much fruit. Now you have a delicious and easy recipe! Are you ready to take on the mountain? If you haven’t already started planning a winter vacation, Snowshoe Mountain resort is a magical place to visit with friends and family. This December marks 45 years since Doc Brigham officially founded our favorite mountain- Snowshoe- and you are invited for the celebration! To celebrate that grand day, Snowshoe Mountain is giving you 45% off your fourth night stay – all season long! This offer is valid for stays between 11/12/18 and 3/20/19 and is based on consecutive night stays at any Snowshoe managed vacation rental property during non-holiday dates. Offer is not valid for December 26, 2018- January 1, 2019; MLK Weekend: January 18-20, 2019; President’s Day Weekend: February 15-17, 2019. Be sure to mention 4th night at 45% off when you book in order to receive your discount. This offer is based on availability and cannot be combined with other offers, some restrictions apply. Offer is not redeemable for cash and is limited to one use per customer. Deposit and cancellation policies apply. Overnight Oats with protein are a quick and delicious breakfast option for days when you need a boost for working out or playing hard. This chocolate overnight Oats recipe is delicious! In a jar or small bowl, add oats, Greek yogurt, Core Power, and chia seeds. Stir well to combine. Cover and allow to sit in refrigerator overnight. Add sliced fruit before serving. Lasts about 3 days. It looks like you had a great time, it makes me want to attempt skiing!